Meet Mark Corley, a bartender at The Silver Dollar – located in Louisville’s Clifton neighborhood and known for its extensive Kentucky Bourbon selection and made-from-scratch Southern food. Mark may sound familiar as he was awarded “Judges’ Choice” with his Wild Wilda Mint Julep in the 14th annual Four Roses Bourbon Rose Julep Cocktail Competition. We spent the afternoon with Mark, over Bourbon, to learn a little bit more about his job. How long have you worked at The Silver Dollar? I started at the Silver Dollar in the summer of 2013, so I’m coming up on 4 years. Are you originally from Kentucky? What do you like most about the culture here? I grew up in Carrollton, Kentucky—smack dab in between Louisville and Cincinnati, Ohio. Kentucky has a great culture that extends beyond the usual suspects of horse racing and Bourbon. We’re a crossroads for the northern and southern parts of the east, and I think that constantly brings new ideas and people to our state. We also have a beautiful geography and sometimes don’t realize how beautiful our state is until we see other parts of the world and realize there’s no place quite like here. What is one of your first memories working in this industry? It was my first day as a host in a buffet. I had little to no idea what I was doing and people can be aggressive with you about where they want to sit. My manager told me to keep my head up, smile and act like I knew what I was doing. That is something I’ve carried to this day, I may not always know what I’m doing but I will keep my head up and keep trying until I’ve figured it out. And what keeps you coming back each day? I just love my guests. Getting to create positive and fun experiences for the people who walk in the door drives my passion. I typically point people who are interested in trying Bourbon to Four Roses Bourbon. It’s easy to drink on the rocks, and if you’re not quite there it mixes great. Start with fun stuff like a Whiskey Sour or a Bourbon Collins, then try out drinks like the Manhattan or Old Fashioned once you start to become accustomed to the taste of Bourbon. I normally use Four Roses Single Barrel as my sipping whiskey of choice. What inspired your Four Roses Bourbon Rose Julep Cocktail Competition winning cocktail Wild Wilda Mint Julep? My Great Grandfather Wilda used to put mint in his coffee and it always struck me as odd. He always said it made it taste better. As I’ve grown up and learned about the intricacies of bartending, I’ve learned that smell plays a huge role in how we taste things. I figured that the mint paired well because you find a lot of chocolate notes in coffee. As you already know, mint and chocolate were made for each other, so I thought a coffee and chocolate mint julep was the way to go. So, what are you making for us today? I’ve made an Iced Green Tea Mint Julep. I used to work at a place where we used a mint green tea syrup in our mint juleps, and they were delicious. A lot of people don’t know, but green tea goes great with Bourbon. I used a mint green tea to give it that classic mint flavor and I used matcha (pulverized green tea leaves) to give the drink a more vegetal and herbaceous flavor as well as a pretty green color. Build your ingredients in a tin. Give it a good hard shake and pour over a glass full of ice. Lastly, garnish it with a mint sprig. You can batch up a bunch of these and serve them from a pitcher at your next party. 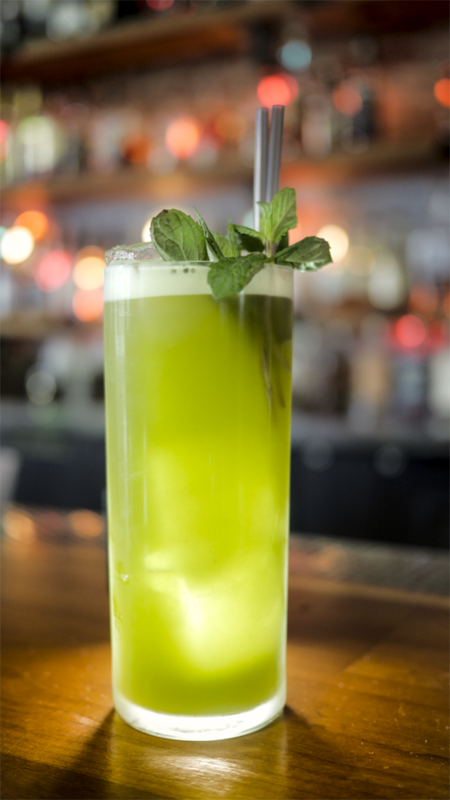 If you craft your own Iced Green Tea Mint Julep, post on Facebook, Twitter or Instagram with the hashtag #HandcraftTheMoment so we can check it out!